Essay article at Aeon online magazine. The existentialist philosophies of Simone de Beauvoir and Frantz Fanon offer important insights into the nature of prejudice. Short article at Aeon online magazine. We are not the puppets of inherited ideologies. We can actively reshape the outlooks that quietly guide our behaviour. Short article on the OUP Blog website. Interview with Nigel Warburton at Five Books website. Central themes of Rethinking Existentialism in the form of reading recommendations. The International Encyclopedia of Ethics, ed. Hugh LaFolette, John Deigh, and Sarah Stroud, second edition. Wiley, 2020. Sartre’s theory of self-deception succeeds where Freud’s fails, but Beauvoir’s existentialism might do even better. 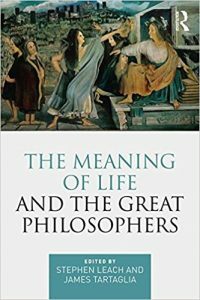 The Meaning of Life and the Great Philosophers, ed. Stephen Leach and James Tartaglia. Routledge, 2018. Simone de Beauvoir offers a single argument that authenticity is morally required and that immoral behaviour is absurd.